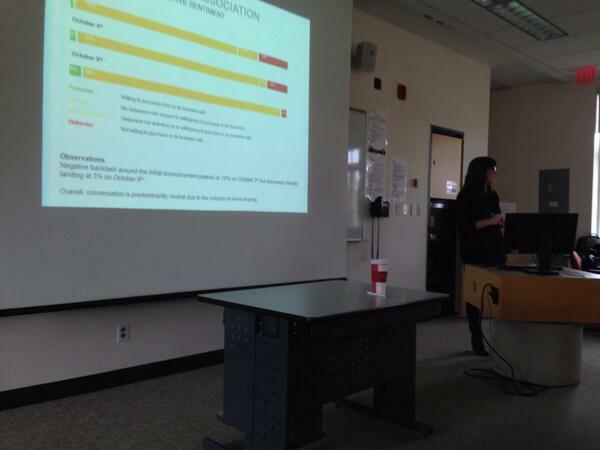 This past week I gave a talk to a group of Humber PR post-grad students about social media and digital analytics, with a focus on storytelling with data. Although the class was interested in best practices they were super engaged when I discussed what they could expect at their first job. Specifically, which tools or scenarios they would be faced with. Before the talk I chatted with a few friends who took the program and asked what they would want to hear. Sure enough it was a) what to expect and b) what cool clients or projects could they work on. Taking their advice truly made a difference in keeping the class engaged. I then opened a discussion around things they were working on and helped them determine the best way to measure their success. I kept it simple, straightforward, and encouraged them to not be scared of numbers. I even threw in a Data GIF for good measure. It was an incredible experience and reminded me why I always wanted to teach.